Patna, February 18: After the coward terrorist attack on the CRPF personnel in the Awantipore area of Pulwama district in Jammu and Kashmir on Thursday, the nation is standing tall for the 40 martyrs’ kin and expressing their condolences. There are few, who not only extended the condolence, but have lent their helping hand for the family members. Among them is Bihar’s Sheikhpura District Magistrate (DM) Inayat Khan, who has decided to adopt daughters of two of the CRPF troopers from the state. Announcing her decision on Saturday, the Sheikhpura DM stated she would bear the education cost and other expenses throughout the life of one daughter each of the two CRPF men — Ratan Kumar Thakur and Sanjay Kumar Sinha. 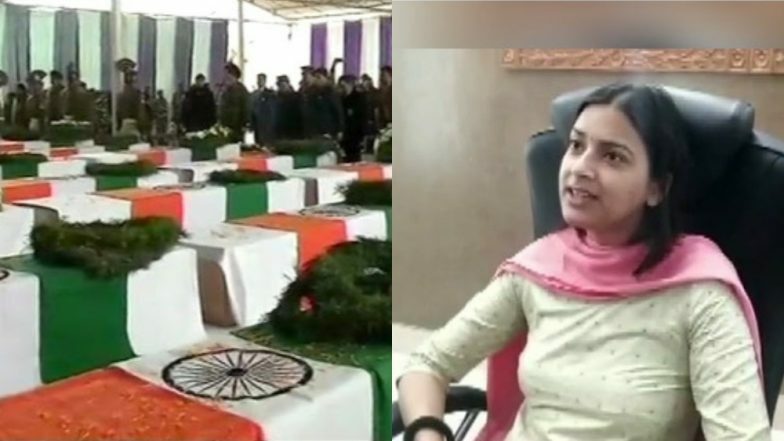 Along with this, the Bihar cadre IAS officer announced that she would donate two days salary to the families of the two martyrs. Pulwama Terror Attack: How CRPF Jawans Fell in JeM Trap. Other than, adopting the education cost and other expenses throughout the life of one daughter each of the two CRPF men, Khan also asked all the government staff to donate their one day’s salary to the families of the slain soldiers. For the noble cause, a bank account also has been set up in Sheikhpura for people to donate generously. As per the report, among the two slain CRPF personnel include Ratan (30) – joined the service in 2011 – is survived by his pregnant wife and a four-year-old son. And the other martyr – Sanjay (45) – is survived by two daughters and a son. Sanjay returned from home after leave a few days before the attack. With this noble move, the IAS officer was applauded on social media. Earlier, various state governments have announced compensation for the kin of the martyrs, who sacrificed their lives for the country. Even the Ministry of Home Affairs has launched a website, https://bharatkeveer.gov.in/ and a mobile application Bharatkeveer through which people can donate money online.